While the car above may look like a vehicle straight out of one of Spielberg's futuristic, sci-fi movies, this sleek piece of automotive engineering is a concept that could one day soon become a reality. Designed by All Jafari, the gorgeous car recently took home the grand prize in the Aurora Survivor 2050 Competition hosted by Mazda the Aurora Solar Vehicle Association. The cutting-edge concept features a seamless aesthetic that appears to almost float across the road. The vehicle is also powered solely by solar and electric power. The car is built to be super efficient, with a top speed of 93 mph. While this isn’t what you’d consider a family sedan – it only seats one passenger and a driver – you might just see it skimming across the roads by 2013. Aurora hopes to bring the concept to fruition in order to showcase the four-wheeler at the 2013 World Solar Challenge. The competition was launched in collaboration with Monash University with the aim of creating an exciting show vehicle that promotes the technology behind the winning Aurora solar car. 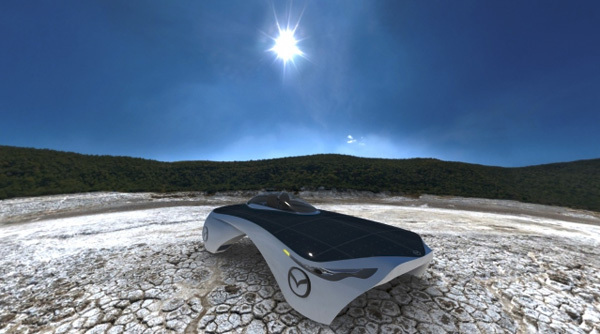 By spearheading the “Aurora Survivor 2050″ project, the collaborators managed to introduce elements from solar racing into a new breed of car that is relatively more practical (2 passengers and luggage space) and more appealing to the general public, all while maintaining the Mazda design aesthetic. The car is built to be super efficient, with a top speed of 93 mph. While this isn't what you'd consider a family sedan - it only seats one passenger and a driver - you might just see it skimming across the roads by 2013. 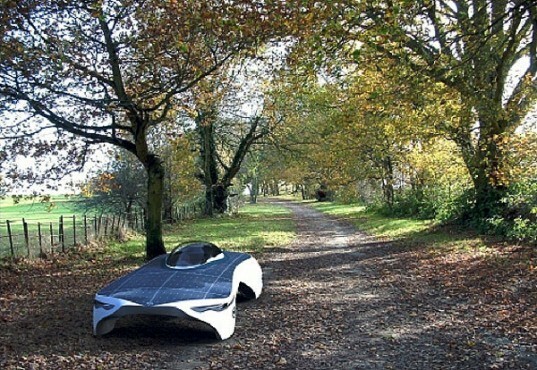 Aurora hopes to bring the concept to fruition in order to showcase the four-wheeler at the 2013 World Solar Challenge. The competition was launched in collaboration with Monash University with the aim of creating an exciting show vehicle that promotes the technology behind the winning Aurora solar car. By spearheading the “Aurora Survivor 2050″ project, the collaborators managed to introduce elements from solar racing into a new breed of car. The updated design is relatively more practical (2 passengers and luggage space) and more appealing to the general public, all while maintaining the Mazda aesthetic. We'd love to take one of these for a spin once they hit the road!